Have you been searching for used car dealerships near me that offer a great variety of used cars, used SUVs, and used trucks for sale near me? When it’s time to decide on what your next vehicle is going to be, do you know where to go? Lucky 7 Car Store is the only used car family of dealerships you need in your search for used car dealerships near me for a full inventory selection. Lucky 7 Car Store has such an expansive range of used vehicles for sale to choose from in Warsaw, Mishawaka, and Fort Wayne. With such a complex variety, the selection they provide should be able to please almost anyone's taste. At Lucky 7 Car Store, we have a significant amount of brand-named automakers at our used car dealerships in Warsaw, Mishawaka, and Fort Wayne. We aim to provide the best-used car shopping experience around. With such a large selection of vehicles, it's no wonder people all over Indiana pass up other used car dealerships near me to come to the Lucky 7 Car Store dealerships to find the perfect used vehicle that fits their lifestyle and their budget. Are you trying to find the best used cars to buy under $5000? Lucky 7 Car Store wants it to be easy to find the best-used cars to buy under $5000, all from the convenience of your home or smartphone. You will see that the Lucky 7 Car Store used car websites can quickly and easily be sorted by the type of vehicle that you are looking for, including the best-used cars to buy under $5000. Once you have found the best-used cars to buy under $5000 on our easy to use Lucky 7 Car Store used car websites that you want to compare, come to take one or more for a test drive today. You will find that it has never been easier to find and compare the best-used cars to buy under $5000 than when you are on the Lucky 7 Car Store used car websites. So, when it comes time to compare cars, visit our Lucky 7 Car Store used car websites or come to our used car dealerships near me in Warsaw, Mishawaka, and Fort Wayne. Are you looking for used cars for sale in Indiana under $5000 near me that offers excellent gas mileage? We have the economic car just for you. Like the Honda Civic used car for sale at Lucky 7 Car Store. This used car for sale can average and MPG of 30 miles per gallon in the city and 38 MPG on the highway! This used car for sale at Lucky 7 Car Store has many desirable features such as steering wheel cruise and audio controls, an MP3 compatible radio, and a wireless cell phone hookup. 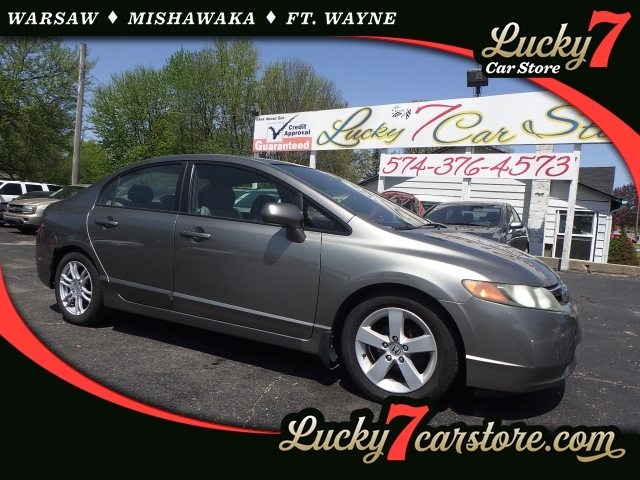 Whether it is this used Honda Civic for sale or another one of our used cars for sale in Indiana under $5000 near me at Lucky 7 Car Store, we have the perfect car waiting for you. Drivers all over Warsaw, Mishawaka, and Fort Wayne love our used cars for sale in Indiana under $5000 near me. You can too when you come to one of our Lucky 7 used car dealerships near me. When you are looking for used car dealerships near me for used cars for sale in Indiana under $5000 near me, come to Lucky 7 Car Store. Our Lucky 7 Mishawaka location Car Store can be reached at 574-314-5368. Our address is 1112 East Mckinley Ave. Mishawaka, IN 46545. Our Lucky 7 Warsaw location Car Store can be reached at 574-376-4573. Or stop in and see us at 222 South Bronson St. Warsaw, IN 46580. Lucky 7 Car Store Fort Wayne can be reached by calling 260-424-8866. You can stop in and see us at 2011 N. Clinton Street in Fort Wayne, IN 46805. Stop into the used car dealerships near me of Lucky 7 Car Stores in Warsaw, Mishawaka, and Fort Wayne to check out our selection of used cars for sale in Indiana today.